1 Color Photography Concepts. 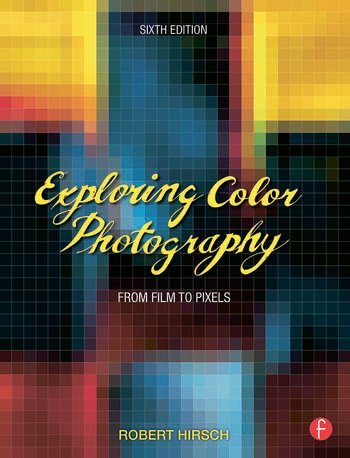 2 A Concise History of Color Photography. 3 Exposing the Light. 4 Filtering the Light. 5 Seeing the Light. 6 Visual Language of Color Design. 7 Working Color Strategies. 8 The Interaction of Color, Movement, Space, and Time. 9 Digital Input. 10 Analog Input: Color Films. 11 Digital Output. 12 Analog Output: Color Printing. 13 Color Projects. 14 Photographic Problem Solving and Writing. 15 Presentation and Preservation. Robert Hirsch is a photographer, writer, curator, and the director of Light Research (lightresearch.net). His books include: Light and Lens: Photography in the Digital Age, Seizing the Light: A Social History of Photography, Photographic Possibilities: The Expressive Use of Equipment, Ideas, Materials, and Processes, and Transformational Imagemaking: Handmade Photography Since 1960. Hirsch is a former Associate Editor for Digital Camera (UK) and Photovision, and a contributor to Afterimage, exposure, Contact Sheet, The Focal Encyclopedia of Photography, History of Photography, The Photographic Collector, The Photo Review, and World Book Encyclopedia as well as former Director of CEPA Gallery. Hirsch’s work has been exhibited in over 200 solo and group shows.